This booklet is for people with HIV who experience side effects from HIV treatments or other physical symptoms that may be due to HIV infection. 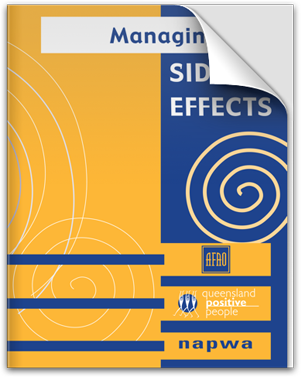 It is intended as a guide to help you identify the kinds of side effects that some people with HIV experience, and to provide suggestions on how to prevent, manage, reduce or eliminate some common side effects through the use of medicines, complementary and supportive therapies or practical measures. Because some side effects can be serious, it is highly advisable that you discuss any side effects you have, or treatments you plan to use to manage them, with your doctor or health care provider before deciding on any course of action. Not everyone taking treatments experiences side effects, but most people can benefit from knowing how to recognise and manage them should they occur. The objective of HIV treatment is to keep you well and maximise your quality of life, but side effects can make it hard to stick to your treatment schedule. Knowing how to minimise any side effects can make a huge difference to your wellbeing and can help ensure that you get the most from your treatments. Which drugs cause which side effects? Not all the suggestions in this booklet will be suitable or appropriate for everyone. Also, there is not enough room to list every known side effect or HIV symptom here. If you experience side effects or physical symptoms that worry you, ask your doctor or health care provider for advice. It may be helpful to keep a record of symptoms and side effects to show your doctor. It’s also important to tell your doctor about all the medications and complementary therapies you are taking as side effects can occur with any treatment including alternative and complementary therapies. Stress Management (relaxation techniques and hobbies for example). Exercise (both aerobic and stretching). Nutrition (good diet and the thoughtful use of supplements). Social and spiritual interaction (communicating with friends and family and connecting with your spiritual beliefs and nature). Education (understanding more about your health and disease).